Joe Lender's loan portfolio grew $5 million last year. The Trust Department's revenues grew nine percent. The Market Street branch's core deposits grew to 64% of total deposits. All objective measurements for front liners. But what about support centers? Loan Servicing, IT, Deposit Operations et al? Perhaps they look busy. I have actually heard that before. One CEO said he judges capacity by looking out of his office window at 6pm. Are there cars in the employee lot? Perhaps it's time to add resources. If not, the request for an additional FTE is denied! How can executive management, most of whom did not come from support centers demanding more resources, decide if they should give it to them? One statistic I turn to for clues on the capacity of a support center is how they were operating at their peak. Let's discuss the accompanying table. With the exception of one period with a slight upward blip, this bank has been losing checking accounts over the eight periods measured. Yet the bank has not been reducing aggregate costs because the operating cost per checking account is more than it was eight periods ago. According to these data points, this bank supported eight percent more checking accounts at 13% less cost eight periods ago. This data point suggests an 8%-13% available capacity. Data are like humans. Rarely perfect. When data does not support our theory, we tend to point to its imperfections. So it goes with benchmarks. There are no apples to apples comparison with a basket of banks data compared to yours. But does it represent a relevant data point to consider? The chart below suggests another relevant point of information so an executive can determine the capacity of a support department. 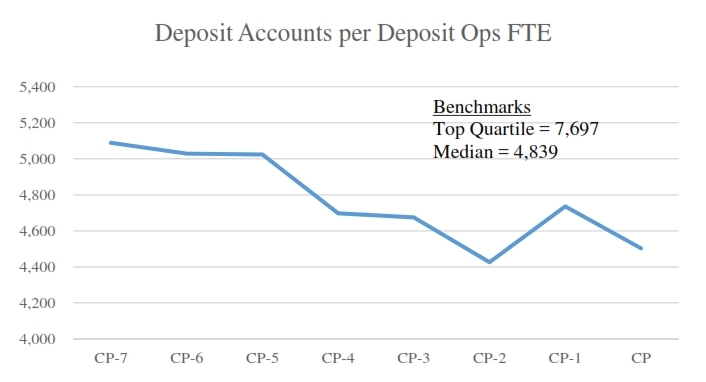 In this bank's case, the number of deposit accounts per deposit operations FTE has been declining. 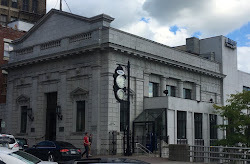 When deposit accounts were greater, this bank achieved the benchmark median. As number of accounts declined, personnel did not, and this metric fell below the benchmark. At the current period, the bank is 7% below the median benchmark and significantly below the top quartile. Time to reduce resources, or at a minimum challenge the department to become more efficient? A third data point to consider when determining capacity in a support center is how much resources as a percent of the relevant balance sheet item does this center consume (see chart)? I have written, spoken, and debated that to achieve economies of scale, you must reduce relative resource consumption as you grow. I have also pointed out that many financial institutions fail to achieve it. This is a key fact in why many mergers don't achieve the economic benefits touted on merger announcement day. To realize economies of scale at your bank as you grow, incorporate the discipline to reduce relative resource consumption per support centers. Given the above table, should this executive increase resources available to the Deposit Operations Department? I don't believe taking one data point of the three mentioned above would be enough. As I contend, there are imperfections to each, imperfections that you can rest assured the Deposit Operations Manager will point out to you when considering a resource request. But the margin for error declines when you consider multiple data points to make a more informed decision. I'm not suggesting seeking data ad nauseam. There is a declining value to adding more data. At some point a leader must lead. And in Schmidlap National Bank's case, the Deposit Operations Department can do better. What other data should be considered in determining support center capacity?